Since its Accusearch ruling in 2009, the Tenth Circuit has been a dicey place for Section 230 defendants. Fortunately, this case goes smoothly. David Silver is an investment banker in Santa Fe. 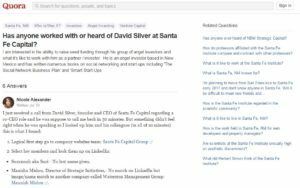 On Quora, someone asked: “Has anyone worked with or heard of David Silver at Santa Fe Capital? 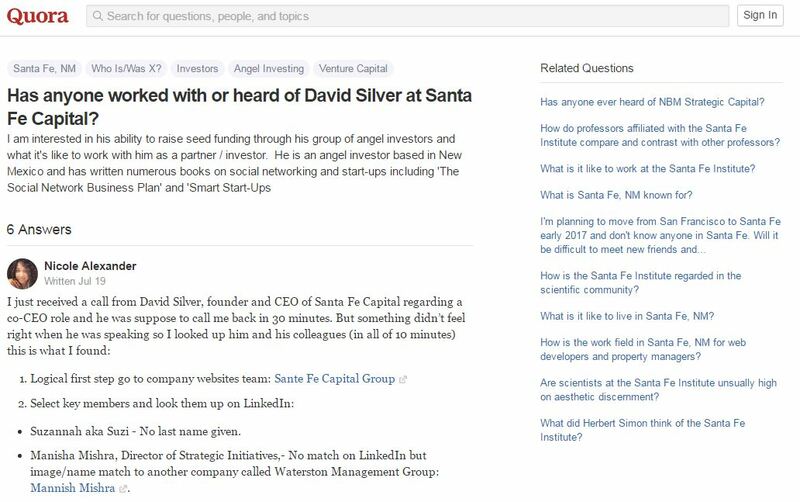 I am interested in his ability to raise seed funding through his group of angel investors and what it’s like to work with him as a partner/investor….” The answers were less-than-flattering, including two that Silver alleges are defamatory and fictitious. He further claimed that Quora employees “could have been” the actual authors. After sending takedown notices that Quora didn’t honor, he sued Quora pro se. Quora moved to dismiss (12(b)(6)). The district court granted Quora’s motion on Section 230 grounds. Somehow the district court ruling slipped through my alerts undetected. In Accusearch, we described “[t]he prototypical service qualifying for this statutory immunity” as “an online messaging board (or bulletin board) on which Internet subscribers post comments and respond to comments posted by others.” 570 F.3d at 1195. Quora fits squarely within this prototype. “Message board” cases should indeed be easy Section 230 defense wins. However, we just saw the Seventh Circuit screw this up, rejecting a 12(b)(6) motion to dismiss when the plaintiff speculatively asserted that the site operator could have written the offending comment but provided no evidence supporting that assertion for the specific comment in question. This court reaches a result that’s more typical, more logical and more consistent with Section 230 precedent. * Silver tried to find support in the 2004 California appellate court ruling in Grace v. eBay, but the California Supreme Court depublished that opinion and made it non-citable authority. Case citation: Silver v. Quora, Inc., 2016 WL 6892146 (10th Cir. Nov. 23, 2016). The district court opinion: Silver v. Quora, Inc., 1:15-cv-00830-WPL-KK (D.N.M. June 13, 2016).